A successful business is one that not only sends customers and clients home happy, but is one that has fewer issues and bottlenecks in administration and management work. We know that its easy to get caught up in the paperwork, phone calls and trying to prioritise what's necessary for every business. At time2manage®- business management solutions & services we provide you and your business with professionals who can take care of making changes to the business, setting goals and rolling out the action plans, while leaving you available to take care of the rest of your business needs. Our idea for the business came from knowing that our techniques work effectively. time2manage recognises the need for strong systems, solid structures and the flexibility to adopt and utilise changes in the workplace as the key areas to maximise the success of your business. Our informative presentations, insightful seminars and interactive workshops are tailored to assist you in achieving change and how to make it work for your business. Expand your knowledge, invest in your experience and take the steps towards making your business even more successful with time2manage today. 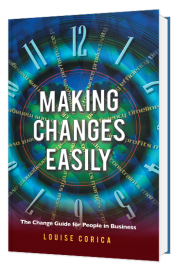 To purchase your copy of “Making Changes Easily”, please go to the Amazon Store or Booktopia.